I am sinfully late with this entry. I’ve been meaning to write it for weeks but then things kept piling up and I forgot and by now it’s so bad I actually have a list of things I meant to post on the blog. As I mentioned time and time again, I love to travel. But I don’t have the funds to do as much of it as I would like, so it usually comes down to one or two bigger trips and several roadtrips within my immediate reach, usually without staying over night. When it comes to travel, my main passion are places by the sea. I love beaches, waterfronts, waves… Most people don’t consider it a holiday unless they’ve been to the beach, in the mountains or living it up in a metropole. So at first sight, Duisburg and the area around it aren’t really attractive. But if you give it a closer look, there are a lot of small – and sometimes even big – things to see and do around here, too. I’ve never been much of a patriot but after 32 years of living here, I figured it’s only right that there’s a little corner of this blog dedicated to ‘home’. I’m not gonna be too strict here. The articles don’t have to be about Duisburg, in the immediate neighborhood or even the same state. As long as it can be reached and visited during a day trip, it’s considered ‘close enough’. That’s why the first part is about Cologne. It just happened to be the first place I visited after I had the idea for this, so why not start there. My history with Cologne is long but not very exciting at all. Mostly, I’ve been visiting it for concerts and other events. It’s where all the big media is located in this part of Germany, so most artists have at least one stop there during a tour. Occasionally, I also made it to the town center for shopping or dinners with friends and for one nice but incredibly stressful month, I even had a job there. It was the most fun job I ever had but it also required about two hours of commute back and forth every day – and that was when the trains were on time. And it happened to be February. Everyone who’s ever experienced the German carnival in the Rheinland area knows how crazy Cologne gets in February. Despite these on and off visits, I had never been inside of the cathedral. It’s impossible not to see it from the outside because it’s huge and smack in the middle of everything, and yet I had never really paid it much attention. So one fine day, just a few days after my return from Mallorca, I grabbed Mel and we drove out to Cologne for some mini-sightseeing and a sprinkle of shopping on the side. Another thing I knew about but had never really visited was the Rheinufer. Being from Duisburg and close to the Rhine myself, going close to the river in other locations seems anticlimactic, but in Cologne, it’s usually a lot nicer than most other places. There are a lot of cute old houses along the shore, some still with their historical decorations and markings. I particularly loved the narrow brown one. The little church here is Groß St. Martin, by the way, a rather small Benedictine church. I don’t know if I’d like it as much if it was placed elsewhere, but right there, near the Rhine and next to the other historical buildings, it fits in quite perfectly. Especially against the blue early-summer sky, of course. As we walked on, we come to the stairs leading up to the cathedral itself and found we weren’t actually allowed to walk across the surface on top of the stairs. To my amazement, Mel explained that this happened quite often while the Cologne Philharmonics are rehearsing in the venue underneath. Apparently, the construction wasn’t so well thought through, and the sound of people’s steps on the surface disturbs the musicians. Instead of investing in more works to fix this, they just put up signs and have security people preventing people from walking across the surface during rehearsals. Probably not a very efficient solution, but makes for funny tourist anecdotes anyway. We walked around the cathedral from the outside and saw a few of the constant works that are being done on and around the building. They started building it in 1248 but as it is with buildings of this scale, it’s never really finished and work never stops. Mel pointed out a few spots where you can see new or renovated parts but to be honest, I wouldn’t really notice it unless you bring them to my attention. I’ve mentioned it a couple times, I’m not religious. But stepping into a huge and impressive building like the Cologne Cathedral, I always almost regret that. I can’t bring myself to believe in any deity or follow the rules of any organized religion but the sheer size of it, the sometimes eery lights, the echoes of hushed voices, the praying people that are seated in the pews…it makes me wish that I could find some kind of hope in it, too. Alas, I have to be satisfied with the feeling of wild awe when visiting these places. We toured the huge space inside of the cathedral with all its many windows and altars and when we emerged, we decided it was selfie time – just us and the cathedral. Thanks to the rough breeze that day, it turned out to be a rather dopey one, though. The rest of the day was fun but far less tourist-y. We did some shopping, got lost inside the biggest Primark I’ve ever seen and had a delicious, carb-heavy dinner at Pizza Hut. 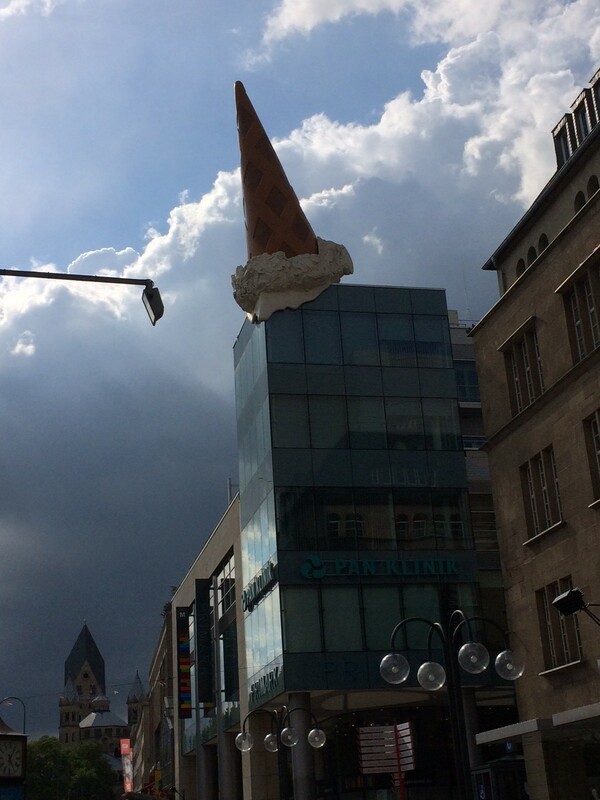 And I also spotted another thing I’d somehow never noticed before – Ice Cream, anyone? If you’re ever gonna visit Cologne by car, though, I don’t recommend the underground parking at Heumarkt. Unless 18 Euros for 4-5 hours seems like a bargain to you.